Worldwide Operating Group (Worldwide Machinery, WRS, Worldwide Machinery Pipeline Division, SUPERIOR Manufacturing and WIPS) just had a successful week-long exhibition at ConExpo. The show ran from March 22 through March 26, and we were able to meet and talk to long time customers of ours, as well as meet new prospective ones. This show presented us with a rare opportunity to interact with customers from each of our divisions at the same time and offer them the chance to see Worldwide Operating Group’s wide range of services and products, and how they relate to our customers. In addition, we used ConExpo to launch our newest product: Titan Trucks. Previously available only for the military, these all-terrain trucks are being offered for commercial use for the first time. 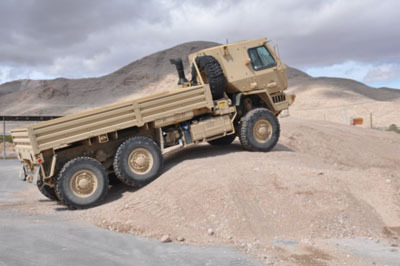 There is no organization in the world more demanding than the U.S. military, and these all-wheel drive trucks are built to meet those tough standards. Titan trucks are capable of climbing inclines of up to 60 degrees, and remain upright if under 30 degrees to one side. There are different engine options available to meet EPA and CE standards. You can read and view some coverage at the blog below. Lastly, we would like to thank our loyal customers for their support and continued patronage, and we also like to welcome future customers to our family of companies. For more information on Titan Trucks please call us at 1-800-383-2666 in the U.S. or 800-9675-3948 international; or write us at titan@wwmach.com.